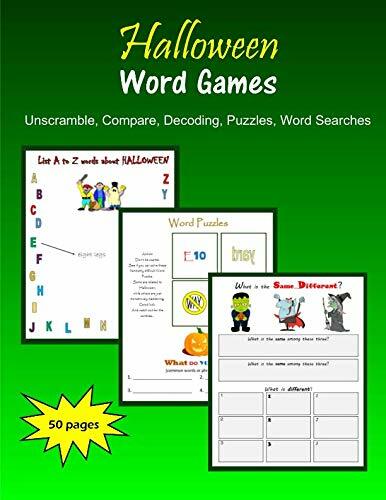 Over 50 printable pages of Halloween word games to challenge your students this holiday, games like Hangman, Unscramble, Word Puzzles, Boggle, Word Searches, Compare and Contrast, Decoding License Plates, Secret Symbols, Similes, Syllables, Favorites, and more. 5 pages of Word Puzzles with Halloween words like “Frankenstein” and common phrases like “I overslept” for students to solve. 5 pages of Boggle-like 5x5 grids for students to make words (connecting the letters). 2 pages of Hangman (or HangSpider). 6 pages of Word Searches: Halloween words, Antonyms, Rhymes, Nouns, Verbs, 6-letter words. 5 pages of Secret Symbols: common words and phrases for students to decode. 4 pages of Unscramble. 5 pages of Comparing Halloween things like monsters and ghosts and jack-o-lanterns. 5 pages of decoding common words or phrases hidden among License Plate letters. 7 pages for students to list A to Z words about monsters, candy, cats, jack-o-lanterns, spiders, Trick-or-Treating, and Halloween. 9 pages of Similes, Syllables, Favorites and more.